This project has gradually tumbled out of its structure like a thin paper bag full of vomit. The rules have been flexed and then broken, a once-beautiful thing crazed and weatherbeaten into something that we barely recognise any more, something that we can’t control, something that we’re not even sure that we like any more. But hey ho, gotta keep on keepin’ on. As previously mentioned, the reason why this album has snuck into the birthday albums project is that I was given it for Christmas two years back, but it must have been a Christmas that was particularly rich with CDs, and it’s taken me until now to get round to listening to it. It doesn’t get off to the most promising start, in my opinion – the eponymous opening track is a bit of a racket, there’s no other way to describe it. Not the worst racket I’ve ever heard, it’s true, but it’s a strange choice to go first. There was a similarly aggressive song on Holy Fire too, but it was track number 9, which strikes me as a much more sensible place for this sort of chaos. 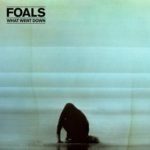 As far as I’m concerned, the album properly gets going with track two, Mountain At My Gates, which is a far more Foals-y sort of song, with shimmery guitars, groovy serpentine bass, and a thick, bombastic drum beat. At the other end of the spectrum is the more ambient-sounding Give It All and London Thunder, and throughout this gamut they provided a range of sonic environments that evokes everything from Coldplay to Echo And The Bunnymen and even a non-entirely un-Royal-Blood-like experience in Snake Oil. Well, you know me, I like a nice jolly bouncy bassline, and both Mountain At My Gates and Birch Tree definitely fulfil in this category. Well, my Christmas haul of CDs didn’t match the copiousness of the birthday lot, but the one album that I did get is from an obscure Hull-based band called Pearl’s Cab Ride who don’t even have a page on Wikipedia, that’s how obscure they are. So how could I resist? I imagine that by now you’re wondering if this series is ever going to end, or if I’m going to keep finding weak excuses to prolong it indefinitely.